As I plot out my 2013 Conservation Big Year, I’ll be working out an itinerary to allow me to see as many of the 174 species on my “target list” somewhere where active work is ongoing to protect them. 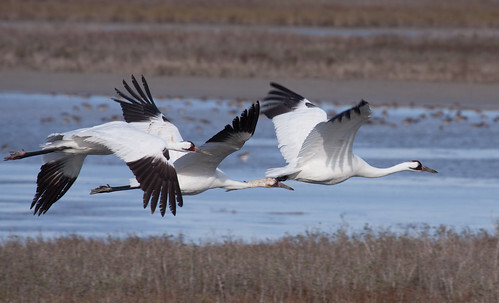 For example, for Whooping Cranes, that could be in Aransas National Wildlife Refuge on the wild flock’s wintering grounds, Wood Buffalo National Park on their breeding grounds, the Audubon Rowe Sanctuary where they often pass through on migration, Horicon Marsh State Wildlife Area where some of the reintroduced migratory birds are being released, and/or Chassahowitzka or St. Mark’s National Wildlife Refuges where those birds winter. I’ll be trying to find ways to travel that minimize the energy used for this, because I do see the irony in calling something a conservation anything when it involves so many miles traveled. There’s a permanent link to my target list at the top on the right: I’ll be adding hot links to each species as I build a webpage explaining why the bird is a species of concern, what issues it faces, what is being done to help it, what its prospects are, and my plans for seeing it. This entry was posted in Uncategorized on November 4, 2011 by Laura Erickson.